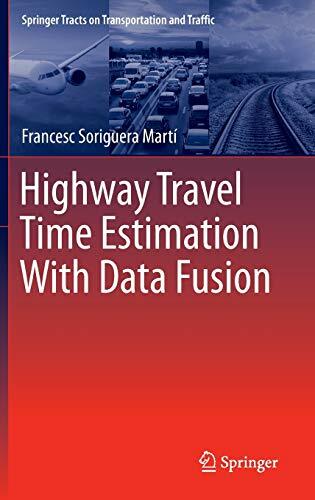 This monograph presents a simple, innovative approach for the measurement and short-term prediction of highway travel times based on the fusion of inductive loop detector and toll ticket data. The methodology is generic and not technologically captive, allowing it to be easily generalized for other equivalent types of data. The book shows how Bayesian analysis can be used to obtain fused estimates that are more reliable than the original inputs, overcoming some of the drawbacks of travel-time estimations based on unique data sources. The developed methodology adds value and obtains the maximum (in terms of travel time estimation) from the available data, without recurrent and costly requirements for additional data. The application of the algorithms to empirical testing in the AP-7 toll highway in Barcelona proves that it is possible to develop an accurate real-time, travel-time information system on closed-toll highways with the existing surveillance equipment, suggesting that highway operators might provide their customers with such an added value with little additional investment in technology.